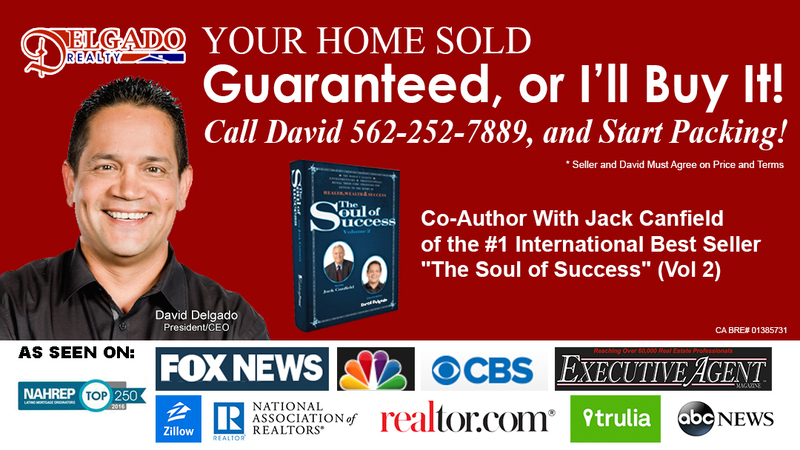 Your Home Sold Guaranteed or David Delgado Will Buy It! Welcome to SearchAnyHomeOnline.com, a website dedicated to serving the real estate needs of the Metro Los Angeles area. Inside these pages you will find a wide variety of wonderful homes in all price ranges and online resources, easily available to you with just a click of your mouse. Building personal relationships is the foundation upon which Delgado Realty Group was built, and it continues to be the cornerstone of our company. With over 70 combined years of experience, our team is dedicated to providing a worry-free transaction from home search to negotiating, closing and beyond. Our winning team of agents, managers and support staff are focused on a single common goal: the ultimate satisfaction of our clients. Whether buying property in the Los Angeles area or obtaining the highest value for the sale of your investment, you will not find a more focused, knowledgeable, or specialized group of professionals to care for your interests. We strive to provide a high level of customer service. From high-end resale homes to investment properties, to new developments, no real estate transaction is outside the realm of DRG expertise and professional service. We guarantee it.